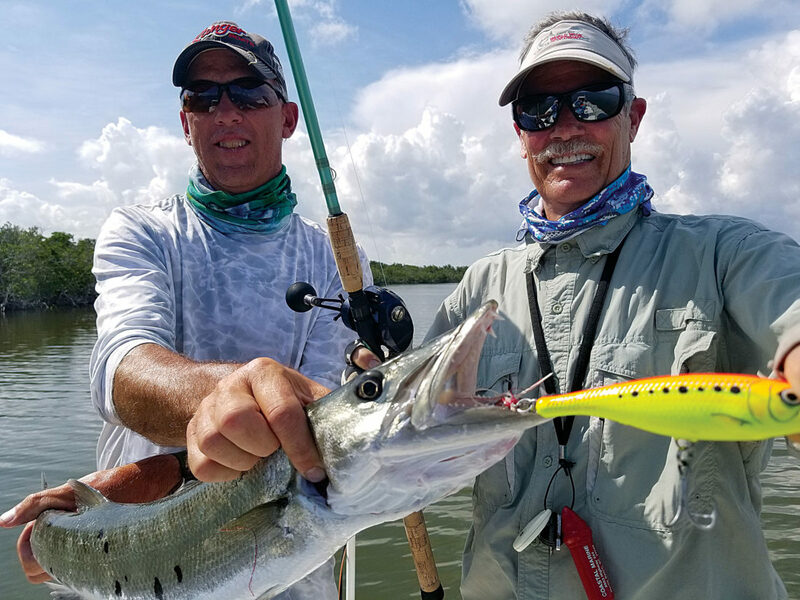 Mort Bank, Bismarck, right, and Robert Miller, Garrison, show off a toothy barracuda that attacked Bank’s Rapala topwater popper in two feet of water. KEY LARGO, FLORIDA – Saltwater fishing is an entirely new realm for a freshwater angler. The aim of the game is the same – try to catch fish – but the methods used to do so and the surrounding environment are completely different. 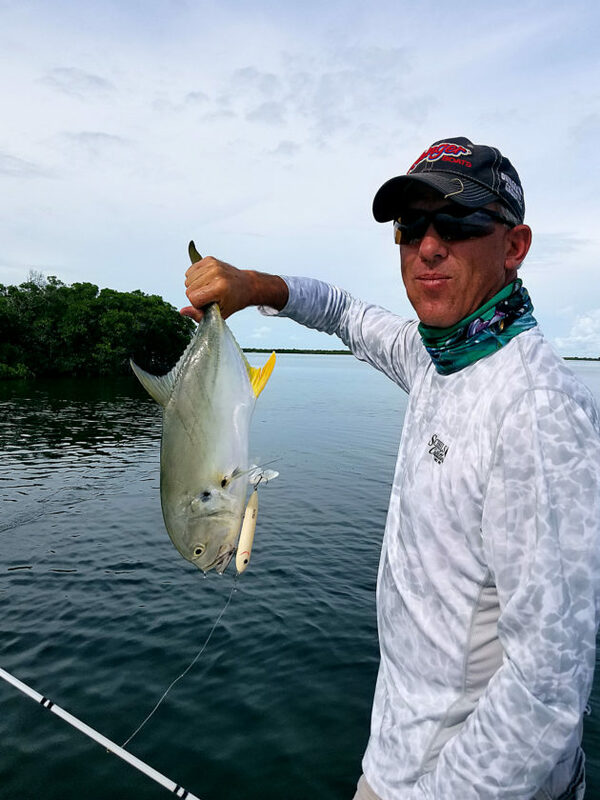 Miller recently spent nearly a week fishing on the flats in the Key Largo region of the Florida Keys, dubbed the “sport-fishing capital of the world.” It was a new experience for him. Like the majority of North Dakota fishermen, Miller primarily targets walleye. Fishing for that species often involves subtle presentations and accurate boat positioning. Bites can be light and finicky. Equipment must be sensitive, especially when fishing in 25 feet of water or more. On most days, feel is everything. Live bait such as nightcrawlers, leeches or minnows are often used on small hooks tied to six- or eight-pound test fishing line. Robert Miller, Garrison, landed this Jack Cravalle using a topwater Zara spook during his first saltwater fishing experience. The spook lure has no action on its own but becomes an enticing presentation with a side-to-side “walk the dog” cadence provided by the fisherman. Miller’s first saltwater fishing adventure required a dramatic change in tactics. The fishermen he was sharing the boat with were using 30- and 40-pound test line and tossing artificial lures, most of them of the topwater variety. Other lures ran perhaps a foot beneath the surface, quite a change from most diving crankbaits found in tackle boxes throughout North Dakota. Behind the boat trailed a large bobber, bigger than a softball. Beneath it was a large circle hook poked through a chunk of freshly caught fish. A big “clothes pin,” the type worn by divers engaged in spearfishing, hung off the side of the boat as a chum stringer to attract sharks – black tip, lemon, broomhead, nurse, spinner, bull and hammerhead among them. It wasn’t long before the clicker on the shark reel sounded loudly as the bobber plunged beneath the surface at high speed. Miller quickly handed his fishing rod off to another occupant of the boat, which freed him up to handle the shark rod. Instantly the battle was on. When Miller brought his first shark boatside, a three-foot black tip, he was eager to lift it out of the water. Fortunately, the shark was small enough to do so with limited risk of being severely shredded by razor sharp teeth. After congratulations and a few photographs, Miller released the leathery fish back into the water. “Holy cow! I held a shark. That’s unbelievable!” said an ecstatic Miller from behind an all-day smile. He would catch two more sharks shortly thereafter, one of which was in a school of sharks swarming near the boat for several minutes. Just when it seemed the sharks had disappeared from the area the bobber took off wildly. This time it was a larger shark, about five feet long. It was exciting but too large of a carnivore to safely bring into the boat. A long metal rod with an S-curved end was used to dislodge the hook. Miller did most of his fishing from atop a tall platform at the rear of the boat, a position often used for utilizing a long push pole to maneuver a boat silently through very shallow water. However, it also serves as a great viewpoint to see down into the water and observe what is happening below. “It was like looking into an aquarium the whole time,” remarked Miller. From his vantage point Miller watched stingrays, tarpon, barracuda, Jack Cravalle and many other fish. He could also watch his lure, and he worked it back to the boat, seeing fish following it. His first catch was a fish that erupted on a topwater lure. When he brought it to the boat and lifted it out of the water his reaction was typical of someone fishing in the ocean for the first time. “That’s a speckled sea trout, the most sought-after fish in Florida,” answered fishing partner Mort Bank, Bismarck. As Miller became more and more accustomed to working topwater lures the fish began to react to his presentation. Miller reacted loudly when a Jack Cravalle rushed from beneath the cover of mangrove trees lining a shoreline and crushed his lure. “That was so cool! I got to watch the whole thing,” said Miller. On several occasions a pod of dolphins would swim in the vicinity of the boat. They are a huge fish and never fail to amaze the viewer. Miller was fascinated by them. “I’m not kidding. I’m trembling,” said Miller after a dolphin family porpoised a few feet away. One calm morning the sound of water slapping attracted our attention. It was a lone dolphin that would raise its tail high out of the water and then use it to loudly slap the water. We guessed the huge mammal was trying to attract other dolphins to the area. A few minutes later the big fish swam about 100 yards to within a few feet of two idling Jet Skis and surprised the riders. Playfully, the dolphin turned and, with a loud slap of his tail, doused the riders with saltwater. Late in the afternoon of our final day on the water, Bank provided a spectacle of his own. In a 90-minute stretch of fishing a shoreline in two to three feet of water, he hooked tarpon, Jack Cravalle, barracuda and caused several other fish to boil violently around his lures. It was a seminar on how to fish and have fun doing it. Miller soaked in the expert display with rod and reel. “Fishing with good people makes it all that much more fun,” remarked Miller. Raegan DesLauriers tosses a pumpkin toward the pins in pumpkin bowling at Minot Parks’ Hay Days Sunday in Oak Park. It wouldn’t be fall without a hayride, and Minot Parks provided one at its first Hay Days in Oak Park Sunday. The two-day event was filled with games, food, vendors, music and a Saturday night dance. Dan, left, and Jeff Coggins hold a tray of some of the oyster mushrooms available at their farmers market booth in Minot Sept. 20. Roman Froseth, left, paints a pumpkin as Greyson Froseth, right, prepares a paintbrush for his next project at the Minot Parks’ Hay Days Sunday in Oak Park.